Applications and Integration Blog: How to Design ADF Bounded Task flow Pages. How to Design ADF Bounded Task flow Pages. In this post I will discuss , What is Bounded taskflow and How to design bounded taskflow with Oracle JDeveloper. 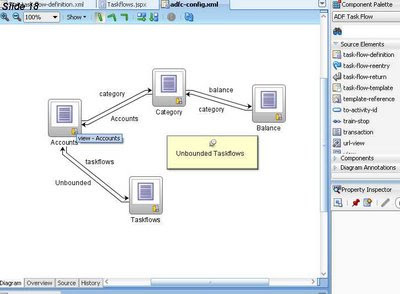 What is Bounded Task flow - As name says these are the task flows with well-defined boundary. They have activities of type -View, Router, Method call , task flow call and return etc. 1.Single point of entry & zero or more exit points. 2.Use as region on a page with Page Fragments. 3.You can pass parameters to bounded task flows. 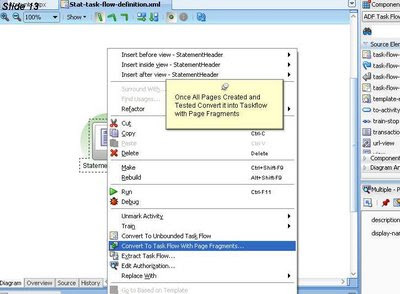 Initially create bounded task flow flow with pages and then convert into fragments after testing pages completely. Please note that you cannot run individual fragments itself. Create unbounded task flow and then extract part of it as unbounded task flow. Jdev provide us option to convert Bounded task flow with pages into Bounded task flow with fragments and vice – versa in single click of mouse. As set of pages and Other activities in a large application. As a region, providing navigation between page fragments in a single containing page. Use as a modal dialog box, launched from a page. For More Info on ADF Pages , refer my posts on ADF. In this example, I will explain how a Unbounded task flow Page work. For my test case I have design a JSF Page with Panel Accordin (with 2 Panels). Panel 2 has bounded task flow with 3 fragments along with Train Control. Here, I will discuss unbounded task flow only. web Tier > JSF Page > ADF Task Flow). Uncheck "Create with page Fragments", as we canot run the Fragments for testing.We can Run only Pages. Drop "view" component from component pallete into task flow.Since this is First page , it will work as Default Page.Default page is always surrounded by GREEN Circle. Drop other required pages.Since we have checked the checkbox "Create train", JDEV automatically create train beteen pages. After you drop all pages , Drop the Return Activity. Once all components for bounded pages droped on task flow, create the pages, by double -click the page .It will create .jspx file. Once Pages are readt , Drop the train components from component pallete. Drop train component for each page. Once all pages are tested , convert them in page fragments as shown below. Page Fragrements will stores with extension jsff. You can convert back fragents into Pages , as shown below. Go to adfc-config.xml and design Page "Taskflows.jspx", as shown below. 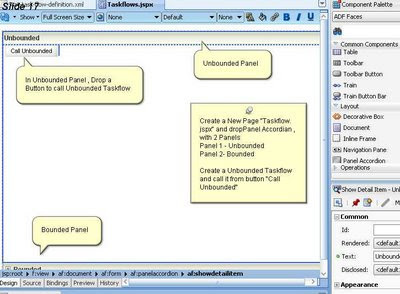 Drag "Panel Accordin" component on Taskflowx.jspx. 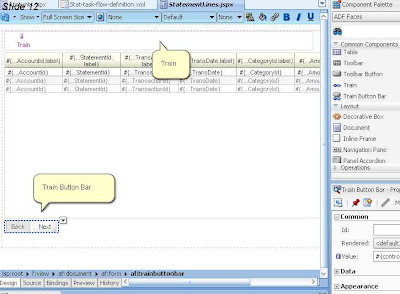 In Bounded Panel Drop the bounded task flow as region. 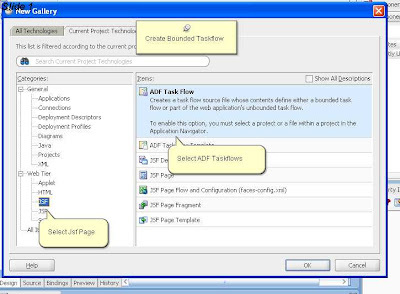 Unbounded Task flows to be called from Taskflows.jspx. Bounded task flow droped as region on "taskflows.jspx".